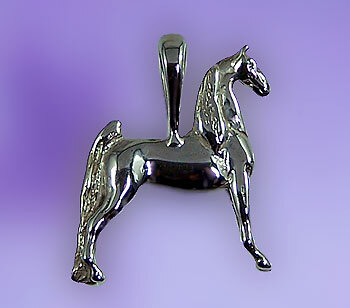 Sterling Silver Saddlebred pendant perfect for any occasion. Ideal for a necklace, a choker, lapel pin, tie tack, or a charm bracelet. Parked out at the line up after a great ride. Enjoy this solid three dimensional five gaited Saddlebred pendant. Sure to bring happiness to anyone who appreciates quality jewelry and quality horsemanship.